No time to shop at the market each week? Our Downtown Fresh Box gives you farm-fresh goodness to go! The Downtown Farmers Market Fresh Box is a seasonal selection of fruits and vegetables brought together in one convenient, weekly box. Each box is $28 and contains 5-7 fresh, in season items sourced from VFM farms and producers, with options to add on artisanal cheeses and farm-fresh eggs. 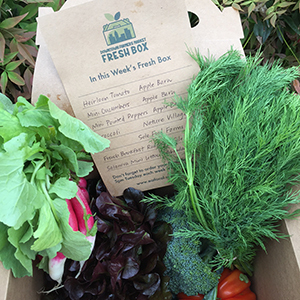 The Fresh Box is available for pick-up at the Downtown Farmers Market each Thursday from June-October, or by direct delivery to your office or apartment on group orders of 5 or more. We do the picking – all you have to do is enjoy! Fresh Box can be ordered via weekly or seasonal subscriptions – find out more or order Fresh Box online today! The Downtown Farmers Market Fresh Box season has wrapped up but we’re launching a Winter Fresh Box soon! Stay tuned for more details.